*** WINNERS *** Mike and Heather are Living the Life of Riley! CONGRATULATIONS! I want to give a big and hearty CONGRATULATIONS to Mike, the winner of the 13 Words Children's Book Prize Pack from Lemony Snicket and Maira Kalman! Mike now has 48 hours to confirm! My fave word is baby. I also want to give a big and hearty CONGRATULATIONS to Heather, the winner of the Eureka 3272AV Bagless Upright Vacuum Cleaner with Filtrete Accessories! Heather now has 48 hours to confirm! 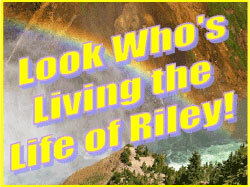 *** WINNERS *** Wanda and Susan are Living the Life of Riley! CONGRATULATIONS!